Notes about Castile Soaps, Carrier Oils, Essential Oils & Natural Lifestyle in the Philippines. 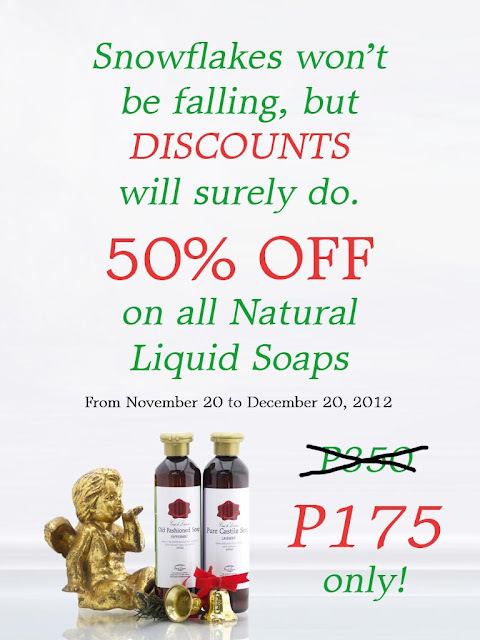 As an early Christmas Gift to lovers of natural products in the Philippines, Casa de Lorenzo's Natural Liquid Bath Soaps go 50% OFF! Instead of paying P350 for a 250mL bottle of our Natural Liquid Bath Soaps, it becomes P175 only. All you have to do is LIKE our Facebook Fan Page www.facebook.com/thecasadelorenzo and SHARE the promo poster from our timeline, and the discount can be applied to your order. Offer is good until December 20, 2012. Where to Buy Castile Soaps in the Philippines?